I never thought I’d say, “let me grab my Nalgene bottle and head out for a bike ride” – but now I can, because of the recently released Nalgene Draft Water Bottle. The soft-squeeze plastic water bottle is easy to operate with one hand, while riding. It shares zero features with the traditional, hard plastic Nalgene bottles popular among hikers for being virtually indestructible. Let’s see how they did. The Nalgene Draft bottle does offer a few differences. 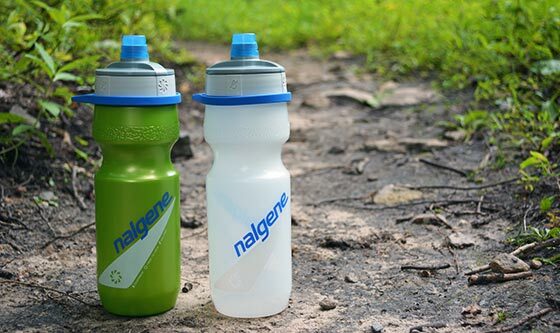 Why choose the Nalgene Draft over other bottles? Leakproof – Easy on/off ‘twist to lock’ mechanism on cap helps prevent leaks. Easy-to-Stow Design – Fits bike cages, cup holders, exercise machines, and backpack pockets. Fits Ice Cubes & Freezer Friendly – Wide mouth opening accommodates ice cubes. Bottle can safely go in freezer to freeze liquids. Easy-to-Clean – Dishwasher-safe, top rack only. Lifetime Warranty – Replacement available if bottle breaks. Those are features we all want, no doubt about that. 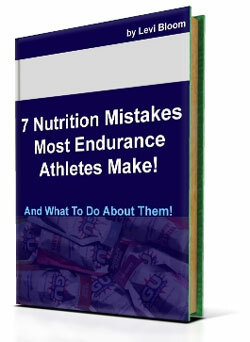 But as I look at that list, I feel like those are just standard features required of water bottles! Nothing really ‘wows’ me or gets me excited. I like the locking lid, but those are relatively common now. I like that it fits into bottle cages and that ice cubes can fit inside it, but unless your only experience with water bottles is the fad known as S’well, those are basic requirements found on virtually every decent bottle. BPA-free is generally assumed now, too. And yeah, I love when a company offers a lifetime warranty, but what does that really matter here? Plastic bottles are far more likely to get old and disgusting or simply lost, than they are to break. If I can put both the bottle and the cap into the dishwasher, though, that would be intriguing. Because it’s the caps on these self-sealing bottles that are a chore to keep clean. And while we’re talking about self-sealing bottles (the ones with the automatic squeeze valves), let’s just be real. We’re talking about the Camelbak Podium and all the other brands that are following their lead. 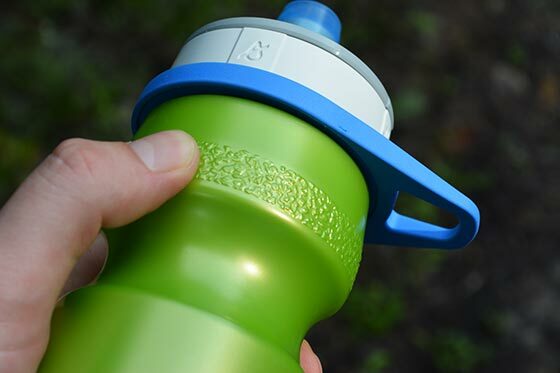 Polar, Specialized, and now Nalgene all offer the bite valve style water bottle lids! Most notably, there is a rubber loop attached to the bottle. Polar offers a similar feature on their bottles, but it’s thin plastic, while this is a thick, sturdy rubber. 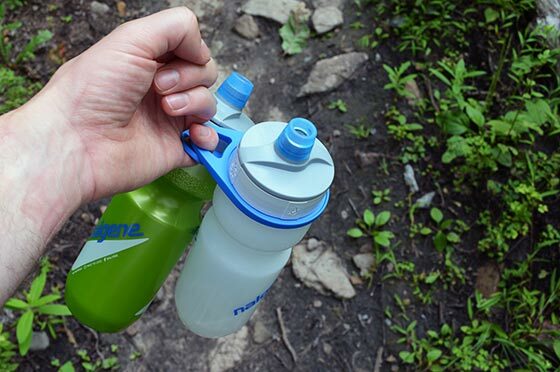 This is a very nice feature if you ever need to carry your bottle with one finger or clip it onto your backpack. Also, the plastic loop on the Polar bottle often pokes you in the face when you drink. The rubber loop on this Nalgene bottle stays out of the way. Camelbak and Nalgene both have similar twist-to-lock caps. However, on the Nalgene, the on/off markings are on the side of the lid, not the top. The markings are also molded into the plastic, so they won’t wear off. That’s pretty cool. On the Camelbak Podium, the markings are simply printed onto the plastic and will wear away over time. The bottle capacity is 22 ounces, which is just right. The bottle is also fairly soft and easy to squeeze (as long as you hold it correctly – it’s noticeably easier to squeeze with an underhand grip). And it fits into nearly any standard bottle cage. Excellent! The cap looks like it would be flimsy and low-quality, but it seems to work fine. You just twist it back and forth to lock and unlock. On the flip side, the thick, rubbery handle looks very high quality, and it makes it easy to carry two of these bottles with one finger! One neat feature I hadn’t even noticed until I was riding is the grippy textured strip near the top of the bottle. 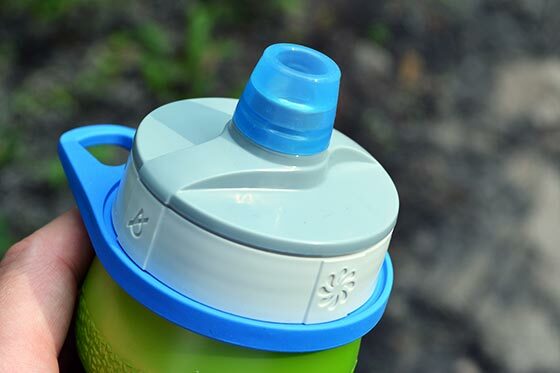 This helps you to get a secure hold on the bottle, even when it’s slippery from condensation. There were no leaks, and the nozzle worked as designed. However, the valve is a bit strange. When you squeeze, the water comes out in an unpredictable spray pattern, rather than a stream. It kind of tickles your tongue! With a retail price of $10.99 (or $9.99 on Amazon.com), the Draft is priced similarly to other bottles, but doesn’t offer anything to really set it apart. Unless you’re a die hard Nalgene fan following @nalgenesoftheworld on Instagram, I’m not sure why’d you choose this bottle. Color choices include natural (clear), green, purple, and berry – maybe one perfectly matches your bicycle? First of all, it’s not insulated – that’s a big factor for many people. I know I appreciate cold water on a hot day. If you don’t need insulation, you can get a Camelbak Podium for $9 (21 oz) or $10 (24 oz). If you think insulated bottles are too expensive, they’re not much more – you could get a Camelbak Podium Chill – which is insulated – for only $13. So the Nalgene Draft is neither the best value nor the lowest price. I should also point out that while the bottle is made in the USA, the cap is from China. If you’re looking for a US-made product, you might want to stick to Polar. 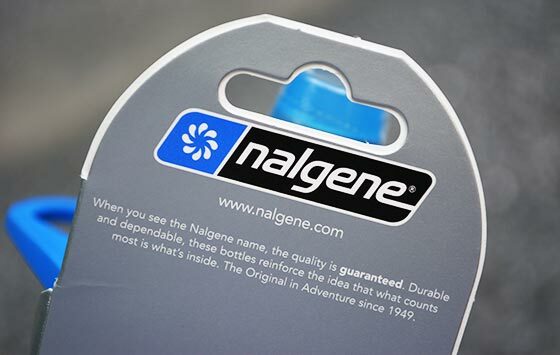 Speaking of which, why didn’t Nalgene just license caps from Polar? If Nalgene and Polar had worked together – Nalgene making a nice bottle and a nice pull tab, and Polar making the awesome Zipstream cap/valve – you’d have a great bottle. And it would be entirely made in the USA! When it comes to cycling, there’s really nothing better than the Camelbak Podium Ice water bottle. But if you don’t want to fork over $25 for one bottle, you could grab either a Camelbak Podium Chill or one of the second-generation Specialized Big Mouth water bottles. Those are great bottles at fair prices. This Nalgene Draft bottle is pretty cool, and not a bad first attempt at a cycling-specific water bottle, but it can’t compete with the current bottles on the market. Unless you’re a die-hard Nalgene fan, I’d pass on this bottle. Does the bottle leach any plastic flavor? No! Not that I know of. I always wash my bottles with baking soda and vinegar initially to get rid of potential plastic smell or flavor, and I did that here. But since then, I haven’t noticed any plastic flavor leaching into my water. And I’ve let water sit in the bottle for days at a time without issue!